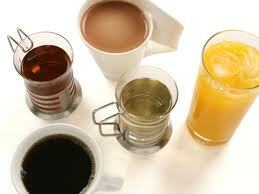 Acidic drinks and foods lower the pH level of the mouth so consuming them causes the teeth to demineralise. Drinks low in pH levels that cause dental erosion include fruit juices, sports drinks, and carbonated drinks. Orange and apple juices are common culprits among fruit juices. Carbonated drinks such as colas, lemonades are also very acidic, as are fruit-flavoured drinks and dilutables. Frequency rather than total intake of acidic juices is seen as the greater factor in dental erosion; infants using feeding bottles containing fruit juices (especially when used as a comforter) are therefore at greater risk of acid erosion. Saliva acts as a buffer, regulating the pH when acidic drinks are ingested. 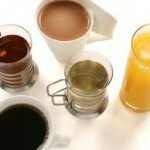 Drinks vary in their resistance to the buffering effect of saliva. Studies show that fruit juices are the most resistant to saliva’s buffering effect, followed by, in order: fruit-based carbonated drinks and flavoured mineral waters, non-fruit-based carbonated drinks, sparkling mineral waters; Mineral water being the least resistant. Because of this, fruit juices in particular, may prolong the drop in pH levels. A number of medications such as vitamin C, aspirin and some iron preparations are acidic and may contribute towards acid erosion. Dental erosion can occur by non-extrinsic factors too. Intrinsic dental erosion is known as perimolysis, whereby gastric acid from the stomach comes into contact with the teeth. People with diseases such as anorexia nervosa, bulimia, and gastroesophageal reflux disease often suffer from this. GERD is quite common and an average of 7% of adults experience reflux daily. The main cause of GERD is increased acid production by the stomach. Acid erosion often coexists with abrasion and attrition. Abrasion is most often caused by brushing teeth too hard. Throthing or swishing acidic drinks around the mouth increases the risk of acid erosion. 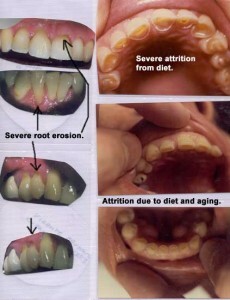 There are many signs of dental erosion, including changes in appearance and sensitivity. One of the physical changes can be the color of teeth. There are two different colors teeth may turn if dental erosion is occurring, the first being a change of color that usually happens on the cutting edge of the central incisors. This causes the cutting edge of the tooth to become transparent. A second sign is if the tooth has a yellowish tint. This occurs because the white enamel has eroded away to reveal the yellowish dentin. 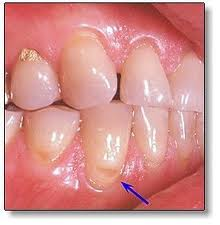 A change in shape of the teeth is also a sign of dental erosion. Teeth will begin to appear with a broad rounded concavity, and the gaps between teeth will become larger. There can be evidence of wear on surfaces of teeth not expected to be in contact with one another. 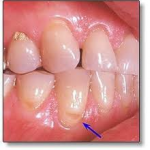 If dental erosion occurs in children, a loss of enamel surface characteristics can occur. Amalgam restorations in the mouth may be clean and non-tarnished. Fillings may also appear to be rising out of the tooth, the appearance being caused when the tooth is eroded away leaving only the filling. The teeth may form divots on the chewing surfaces when dental erosion is occurring. This mainly happens on the first, second, and third molars. One of the most severe signs of dental erosion is cracking, where teeth begin to crack off and become coarse. Other signs include pain when eating hot, cold, or sweet foods. This pain is due to the enamel having been eroded away, exposing the sensitive dentin. Treating the underlying medical disorder or disease. Modifying the pH of the food or beverage contributing to the problem, or changing lifestyle to avoid the food or beverage. Decrease abrasive forces. Use a soft bristled toothbrush and brush gently. No brushing immediately after consuming acidic food and drink as teeth will be softened. Leave at least half an hour of time space. Rinsing with water is better than brushing after consuming acidic foods and drinks. Using a remineralizing agent, such as sodium fluoride solution in the form of a fluoride mouthrinse, tablet, or lozenge, immediately before brushing teeth. Applying fluoride gels or varnishes to the teeth. Drinking milk or using other dairy products. Using a neutralizing agent such as antacid tablets.